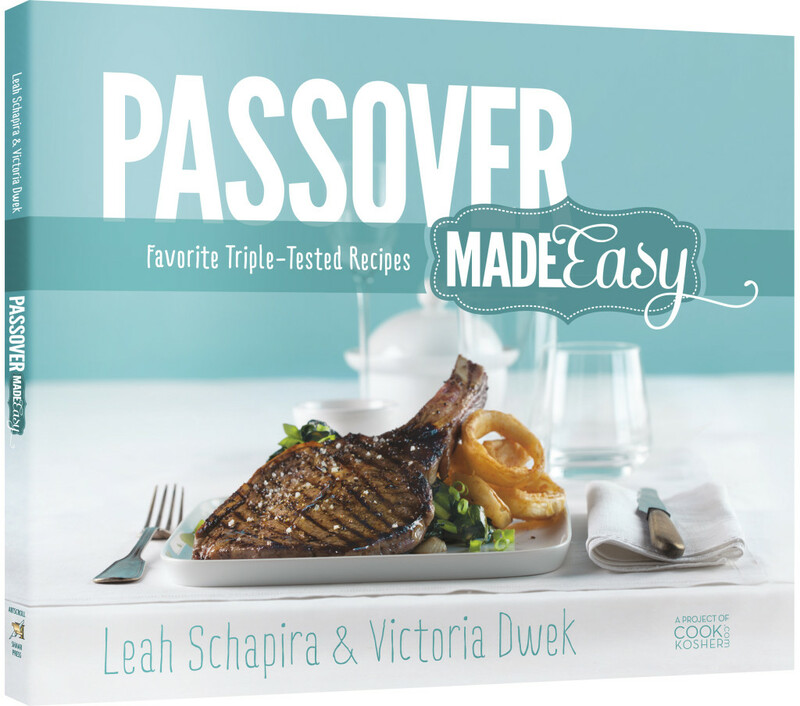 Originally published in 2013by Artscroll, Passover Made Easy is the first installment in Leah Schapira and Victoria Dwek’s Made Easy Series. Since then, this dynamic duo have also published Kids Cooking Made Easy and Starters and Sides Made Easy. Passover cooking can be a tricky thing. Not only is there the prohibition against flour and breadstuffs, but depending on your ancestry, this prohibition can extend to legumes and various grains. Ashkenazi Jews, on the whole, tend to refrain from eating chickpeas, green beans and the like, whereas those from Sephardic backgrounds, allow the consumption of these items as well as others considered kitniyot. To their credit, Leah and Victoria straddle this line very well. Marrying their different backgrounds and styles, they have compiled an exciting and innovative array of recipes that is sure to have a wide and captive audience. Their creativity is evident throughout the chapters, where they take familiar, traditional recipes and add a novel, up to date twist. The easy to follow and easy to use book follows a traditional arc, starting with holiday fundamentals such as homemade mayonnaise and Passover crumbs, to chapters on starters, soups and salads, main courses, side dishes and of course desserts. Each recipe is accompanied by a full color photo, a boon to those who like to know what a dish looks like before they start!! Leah and Victoria have also filled the book with culinary shortcuts and interesting tips on presentation, sure to come in handy for the two seders. 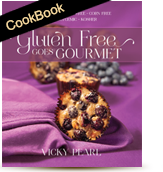 In addition, the authors have included a wine guide as well as suggestions for wine pairings. It must be said that this handy 60 recipe collection reflects both of the author’s background as well as their intimate grasp of the modern Jewish palate. In the salad chapter, for example, there are nods to tradition with recipes for Russian coleslaw and beet pickles as well as a salutation to more modern tastes with recipes for Roasted Vegetable Salad and Pear and Lime Salad. These two strains are also reflected in the author’s exciting choice of Brisket Egg Rolls and Meatballs with Blueberry Sauce in the Starters chapter which also happens to include an updated recipe for Chips and Dip. Creativity and originality co-exist with established and popular favorites in the rest of the chapters as well. I have chosen to include Leah and Victoria’s recipe for Hot Apple Pie with Cinnamon Streusel Ice Cream as part of this week’s blog. As you can see from the photo, it looks scrumptious and a sure-fire winner. 2. Peel and core apples. Slice into rings. 3. In a large mixing bowl, combine potato starch, eggs, oil, sugars, and cinnamon. Add apples to bowl and coat well. 4. Prepare the crust/topping: Combine walnuts and sugar. Place half of the walnut/sugar mixture into the bottom of an 8-inch round baking dish to form a crust. 5. 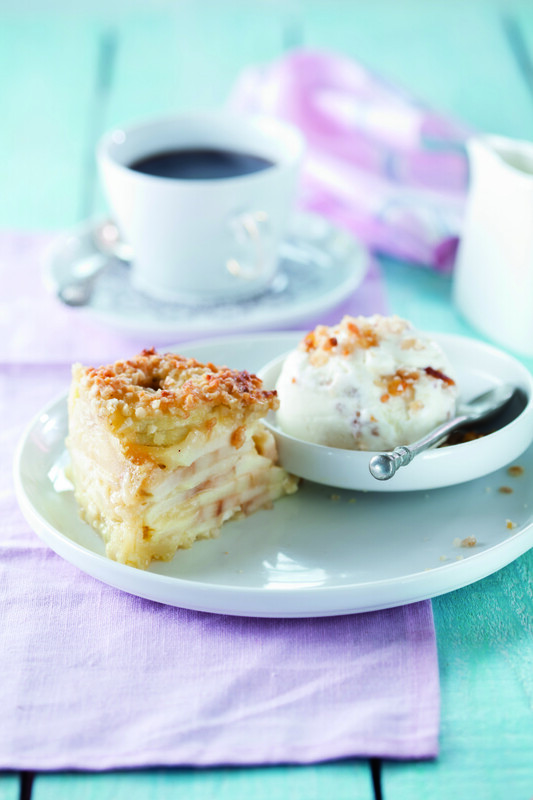 Layer battered apples neatly over crust. Pour remaining apple batter over apples. Let mixture settle into apples. Sprinkle with remaining walnut/sugar mixture. Bake, uncovered, for 1 hour or until golden brown. If top browns too quickly, cover with foil. Serve warm. 6. Prepare the streusel for the ice cream: In a small bowl, combine potato starch, sugar, cinnamon, vanilla, and oil to form crumbs. Spread in a baking pan and bake 20 minutes. Set aside. 7. Prepare ice cream base: In a heatproof bowl set over a pan of simmering water, combine yolks and ¼ cup whipped topping. Whisk often for 8 minutes (this will cook the yolks without scrambling them). Add ½ cup sugar and whisk until dissolved. Place bowl in refrigerator to cool. 8. In the bowl of an electric mixer on high speed, whip remaining 1¾ cups non-dairy whipped topping until stiff. Add remaining ½ cup sugar, vanilla, and cinnamon. Add yolk mixture and mix to combine. Stir in streusel crumbs. Freeze overnight. Serve on hot apple pie. Reproduced from Passover Made Easy by Leah Schapira and Victoria Dwek with permission from the copyright holders ArtScroll/Mesorah Publications, LTD.